It may be that you just want to update the look of your existing shower with a stylish new kit and head. It may be that you just want to update the look of your existing shower with a stylish new kit and head. Or perhaps your shower head is full of limescale?. Whatever the reason for changing, Tapstore.com has a superb selection for you to choose from. The Traditional rigid riser is classically styled in appearance but up to date in performance. With the elegantly designed shower head you can soak up an exhilarating cascade of water in the luxury of your bathroom. 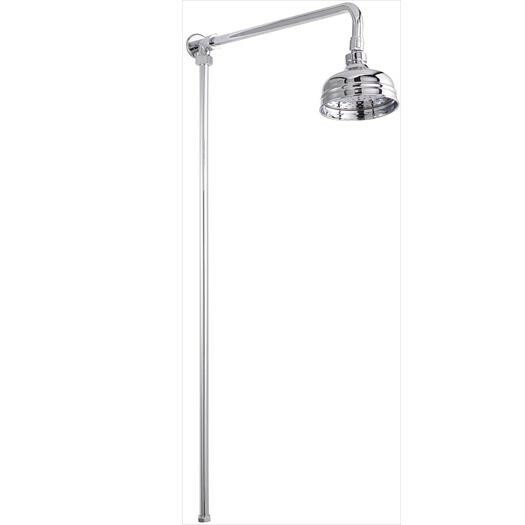 This rigid riser is supplied complete with a 100mm (4" ) skirted shower rose this includes a swivel ball joint so you can easily adjust the angle of this shower head. It is only available in the chrome finish as shown. The total height of this kit is 1000mm and its projection from centre of the riser to centre of the shower head is 350mm. A traditional rigid riser kit with diverter is also available within this section. This product is suitable for use with high pressure water systems and requires a minimum operating pressure of 1.0bar. Guaranteed for 10 years.